Fork or Spoon Guisada | I Am Not A Restaurant! Despite my best intentions and a blizzard, I never did break out the Ninja this weekend. This after I forged my way to the market like a dedicated postal worker through rain, sleet, snow and manic Jersey drivers to buy the beef and green pepper needed for Slow Cooker Carne Guisada. But alas on Sunday the beef still needed to carne and I was missing several of the hours needed for countertop cooking. No matter! That's where the Dutch oven comes in. Slow cooker carne guisada in half the time. I used a favorite Martha Stewart recipe, browning meat and softening veggies stovetop, before combininglot and setting it in a 350 oven for almost 3 hours. Here's the pic and the question, fork or spoon? Note : as written in the recipe, great in tortillas! 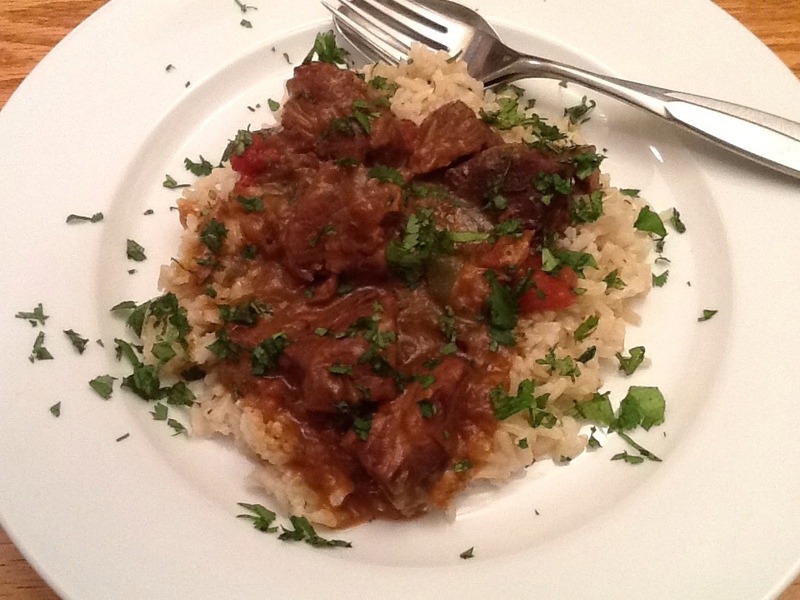 Feb11February 11, 2013 • By Betsy Karetnick • This entry was posted in Beef, Dish of the Day, Guisada, Kitchen Help, Mexican Food and tagged beef, carne guisada, Slow cooker. Bookmark the permalink. I want to try this. I especially like that I can do the beef in the crockpot. And I believe I would try the fork and hope for the best. The spoon would only be a few steps away.